Watch As These Fighting Brothers Crash Right Into A Police Car! The police were dispatched to a house for a supposed domestic violence complaint and ended up having to deal with way more then they bargained for. When the police arrived they saw a man on top of a white car that seemed to be coming toward them. Before the police could react their car was hit. From out point of view the collision looked like somewhat of an accident, but nevertheless the brothers were both taken in and charged. To watch the strange series of events unfold click below! 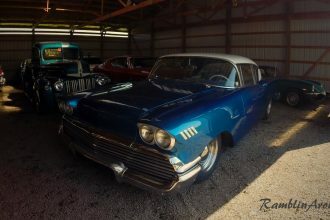 Sweet 1958 Chevrolet Impala Mild Custom V8 Spotted!